You are on Hospital Parking (Hospital Standard Parking). Skip to the next section. 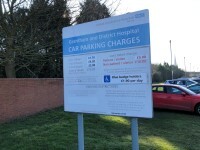 The car park is located in front of the hospital. There is/are 7 designated Blue Badge parking bay(s) within the hospital car park. The dimensions of the designated Blue Badge parking bay(s) surveyed are 380cm x 566cm (12ft 6in x 18ft 7in). 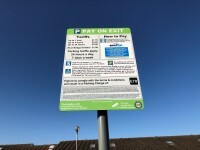 Payment signs are located at the payment machines in the car park and throughout the car park. Payment machines are located next to the Accident and Emergency entrance and the Outpatients Department Side Entrance - Corridor B. 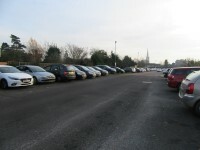 The nearest designated Blue Badge parking bay is approximately 75m (82yd 1in) from the Accident and Emergency entrance. 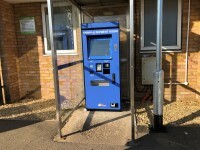 The payment kiosk next to the Accident and Emergency entrance is shown in photograph 5. 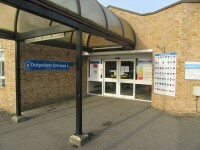 The payment kiosk next to the Outpatients Department Side Entrance - Corridor B is shown in photograph 6. You are on Hospital Parking (Hospital Blue Badge Parking). Skip to the next section. 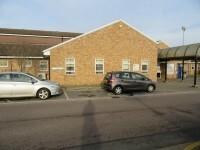 The car park is located at the front side of the hospital building. 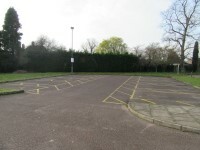 The dimensions of the designated Blue Badge parking bay(s) surveyed are 385cm x 620cm (12ft 8in x 20ft 4in). Payment machines are located next to the Accident and Emergency entrance and the Outpatients Side entrance. 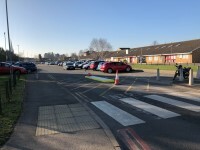 The nearest designated Blue Badge parking bay is approximately 12m (13yd 4in) from the Outpatients Department Front Entrance. 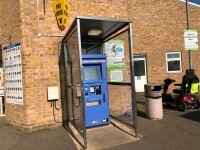 The payment kiosk next to the Accident and Emergency entrance is shown in photograph 3. The payment kiosk next to the Outpatient Side Entrance - Corridor B is shown in photograph 4. You are on Getting To (Ward 6). Skip to the next section. 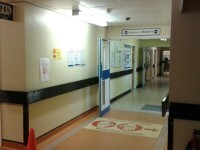 Ward 6 is/are located on corridor C.
Access to Ward 6 is via the Outpatients Department side entrance - corridor B. 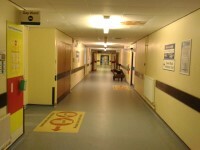 Enter via the Outpatients Department side entrance - corridor B and turn left on to corridor A, at the end of the corridor turn left on to corridor C. The department is located on the right. 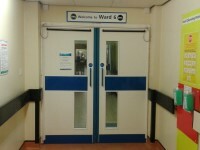 There is step free access to Ward 6. 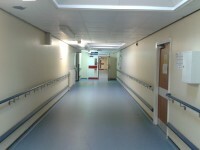 Ward 6 is approximately 100m from the Outpatients Department side entrance - corridor B. 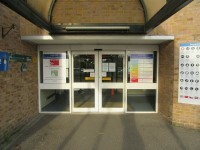 There is a/are manual, heavy, double door(s) between the entrance and the department/service. 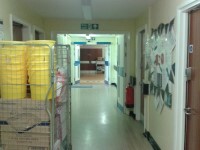 You are on Outside Access (Outpatients Department Side Entrance - Corridor B). Skip to the next section. This information is for the entrance located off of the Outpatients car park at the side of the hospital building. The width of the door opening is 145cm. 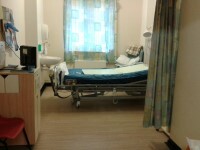 This is a/an medical respiratory ward. There is/are 5 side room(s) available. There is/are 23 bed(s) on this ward in total. The width of the door opening is 173cm (5ft 8in). Accessible toilet facilities for visitors are located on corridor C.
Standard toilet facilities for visitors are located on corridor C.
You are on Washroom (Bay Toilet and Shower). Skip to the next section. The door(s) is/are locked by a locking handle. 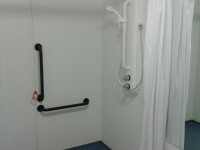 The dimensions of the washroom are 360cm x 182cm (11ft 10in x 5ft 12in). There is a/are coat hook(s) 178cm from the floor. The height of the wash basin is 74cm. The height of the towel dispenser is 103cm. The lateral transfer space is 110cm. The height of the toilet roll holder is 102cm. You are on Accessible Toilet (Bay). Skip to the next section. 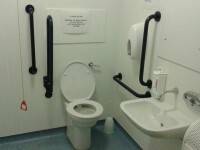 This accessible toilet is located in bay B. The facility is in the male bay. 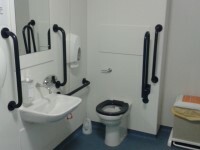 The dimensions of the accessible toilet are 170cm x 198cm (5ft 7in x 6ft 6in). The height of the soap dispenser is 102cm.